For the first 9 months of 2015 the plug-in vehicle sales report for the United States was littered with disappoint thanks to aging and out-going models not selling very well. Thankfully, September saw the tides change, and record setting months have since followed. For February, a 4th consecutive monthly record was set in America with an estimated ~7,881 plug-ins sold, an increase of 13% from a year ago. Despite the decent improvement, BMW once again attempted to single-handedly hold down US sales with the i3, off some 800 units (down to 248) in February. This makes two disasterous month in a row for the compact EV/PHEV. Fortunately, the top 4 models in the US (Tesla Model S, Chevrolet Volt, Nissan LEAF and the Ford Fusion Energi) also showed improvements over the month prior to overcome BMW's handicapping. Like January, relatively new entries from Tesla (Model X), BMW (X5 PHEV), Audi (A3 e-tron), Hyundai (Sonata PHV) and Volvo (XC90 T8 PHV) all added to mostly robust sales from the "power four". *- GM switched over to new 2017 model year inventory of the Chevrolet Volt on February 1st, and somewhat surprisingly it only took 16 days for the first copy to show up on dealer lots. *- In January, BMW posted the largest plug-in sales collapse for the i3/i8 that America had ever seen, falling off some 70% from January of 2015, and almost 90% for the month prior. What was the reason? None (other than the weather) was given. One would think February would be a big bounce back month...yet the German automaker failed to deliver yet again. Below Chart: A individual run-down of each vehicle's monthly result and some analysis behind the numbers. Additionally, waaaaaay down at the bottom of the story is both the 2016 YTD chart as well as the complete 2015 results. 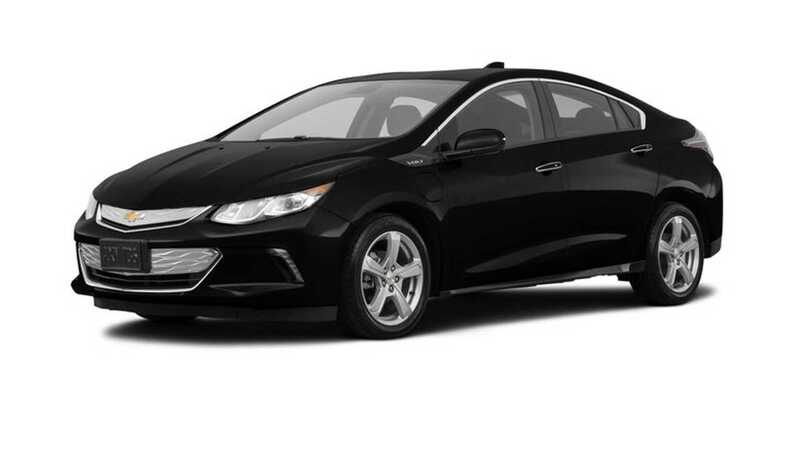 Chevrolet Volt: It was a glass half full/half empty month with the Volt as GM sold 62% more PHEVs in February than a year ago...the issue of course was that they didn't sell a heck of a lot last year. For February 1,126 Volts were moved, which moved Chevy within ~400 units of catching the Nissan LEAF for the title of "all-time best selling plug-in for America". Production of the new, slightly improved 2017 edition Volt (that is finally) available nationwide) kicked off the first week of February and GM surprised us with how quickly they got copies to dealers. Previously in January, GM took down old sales records (at least at the consumer level for retail sales), notching 996 sales during the month (full monthly report here). We had expect it might take until April for national inventories to fill out, but with a thousand-odd 2017 already on dealer lots by the end of February, the prospects for a March surge (and overtaking of the LEAF on the sales charts) looks like a strong possibility. 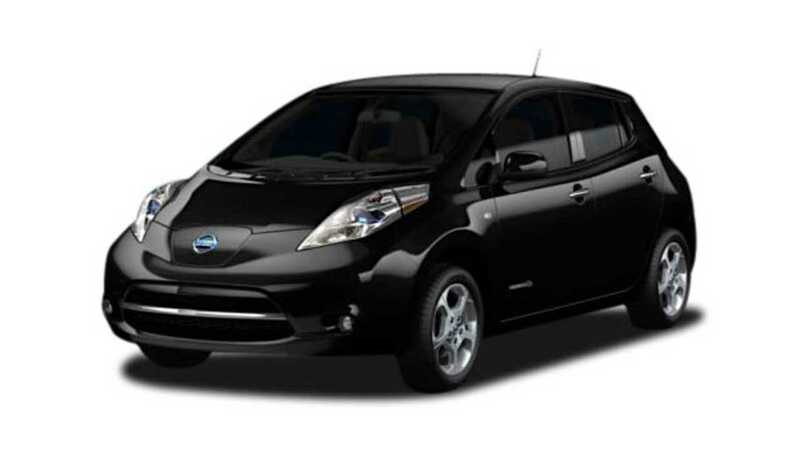 Nissan LEAF: For February, Nissan continued its recent trend of disappointment, logging just 930 sales during the month - some 22% less than a year ago. In the first month of the year, Nissan also logged another month to forget with just 751 were sold. On the plus side heading into the Spring, inventories of the new 2016 edition grew a bit in February, edging up close to 3,500 copies entering March. But perhaps more importantly that the inventory itself is what they are made up of. Less than half of the EVs are of the longer range/107 miles edition. Still, the number is growing, and this 'should' translate into a rebound of sorts for the model (in March) which has been suffering from "long-in-the-tooth-itis" for the past 10 months or so. Theoretically also helping sales going forward, Nissan broke its the near-MSRP pricing in January, offering deeper discounts and more attractive leasing options. 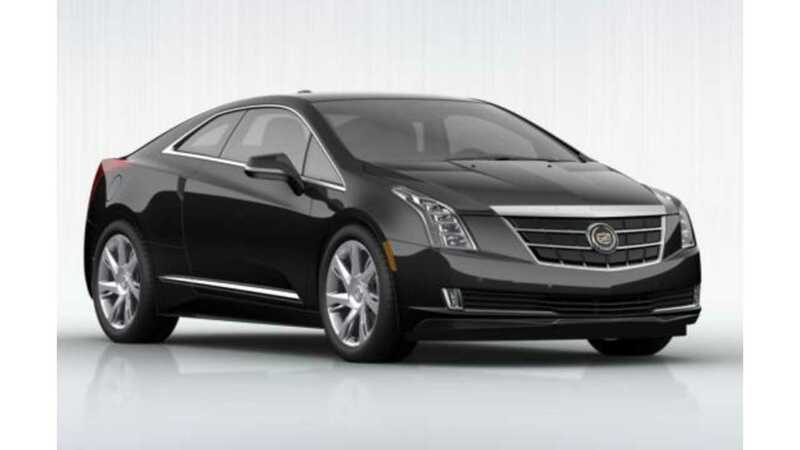 Cadillac ELR: A decent amount of plug-in Caddilacs were sold in February, as GM moved 91 premium plug-in hybrids for the month. Previously in January, 67 ELRs were sold, which was off 27% from a year ago. Considering historical sales levels, this also was a decent result for car all things considered. Curiously, inventory of the ELR increased by about 50% during February, touching close to 300 units for the first time this model year, but as that is not a huge level, it still seems that the sales fate of the ELR will be range-bound (no pun intended) as it rides out this last model year. We though January was the "end of the world" when it came to plug-in sales for BMW, as somehow...and we aren't even sure how this is possible, the company sold just 182 copies, off some 72% or so. February had to be better right? Nope. The sales deficit widened to 78%, as BMW sold just 248 i3s during the month, versus 1,089 a year ago. Curiously, when explaining the entire brand's 4.7% sales decrease in January (18,082 to 18,981), BMW CEO Ludwig Willisch said, "January suffered a bit from the strong storms that froze large parts of the country". This month the company decided to just not talk about current sales or the it at all (with the brand off almost 11%), instead they looking forward to the future, "With Spring only three weeks away and the travel season on the horizon, the growing success of the 7 Series and the 2 Series also makes us confident there’s more to come"
January's terrible result came right after one of the model's best, selling 1,422 sales in December. It appears the up and down seesaw we saw develop late in 2015 will continue into 2016 - only in a much larger way. 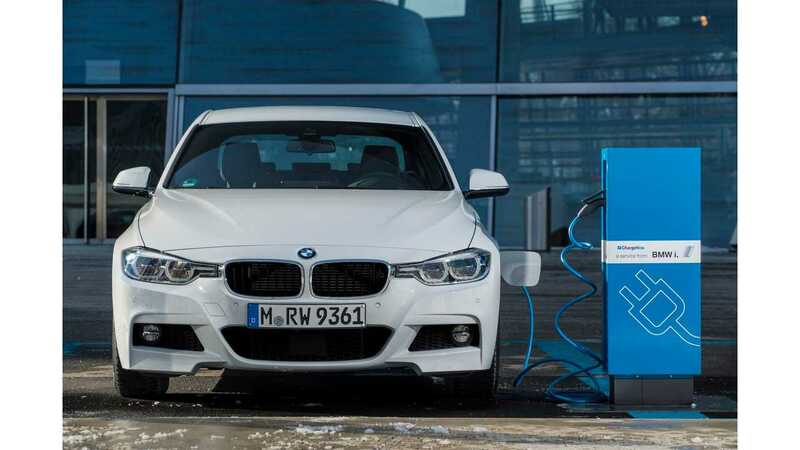 For 2015, BMW sold 11,024 i3s, which made it the 6th plug-in to have reached the 5-digit mark in 2015 (Volt, LEAF, Prius PHV, Model S, Fusion Energi). 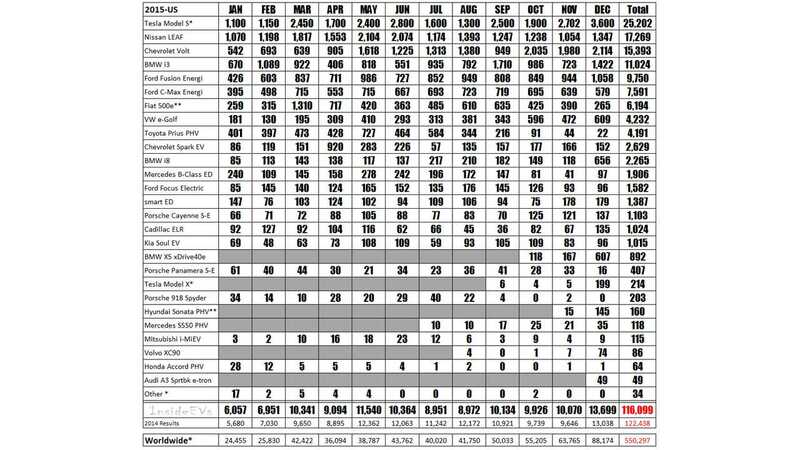 In 2014, BMW sold 6,092 i3s, good for the 7th best overall spot for plug-in sales in America...not bad considering it was only available for 7 full months in the US. Inventory of the BMW i3 fell to a new low for the current model year, with only just over 1,000 copies available heading into March. We simply report from the data we accumulate ourselves, the first hand accounts available from the factory and from the community itself when available - and the number is what it is. So far that has worked out pretty well, with no quarter being off by more than 300 units versus information Tesla has reported publicly. Revisions/disclaimer to accuracy of prior estimates: The 2015 Model S sales chart was adjusted (one time - after the completion of the full year of estimates) by 498 units to compensate for confirmed full year numbers. 2014 sales chart was adjusted (one time - again after the end of the full year of estimates) 611 units to compensate for full year numbers. While past success is no guarantee of future results, InsideEVs is quite proud of its sales tracking for the Model S over the years. Despite Tesla having a market cap equal to other major automakers, the EV maker still seems to operate production and deliveries of its cars solely with quarterly results in mind. In January, production was firmly focused on international customers (and not US consumers who where buried in cars in December for Q4/full year results). Those international customers will be receiving their Model S sedans (for the most part) in the next four weeks. For February, by early/mid-month, many US customers suddenly found production green-lighted on their Model S cars mid-month...especially one had ordered a now discontinued 85 kWh version (replaced by the new 90 kWh battery). It would seem that Tesla is looking to deliver out all these 'old' cars by the end of next month/Q1. Unlike the Model X, Tesla is quite adept at building the Model S, so moving from assembly to delivery is a short (and quarter end friendly) process, which made February really a tale of two months for US customers. 1st half - little production/little deliveries. 2nd half - lots of production, strong finishing ~week for deliveries. 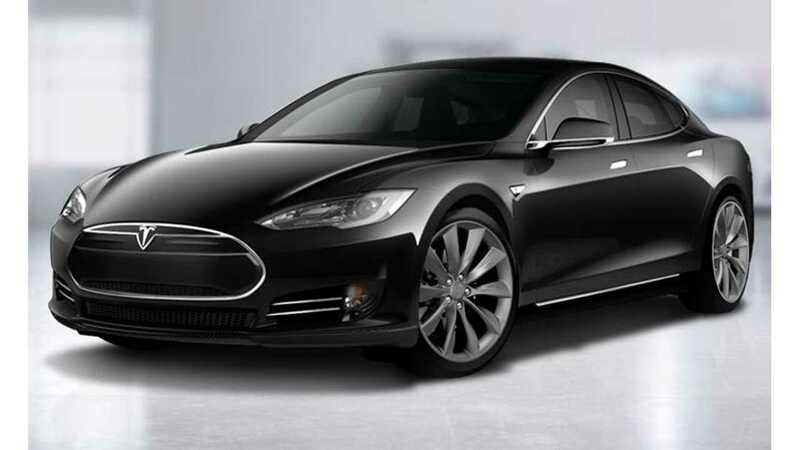 For the month we estimate Tesla delivered 1,550 Model S sedans. With the apparent high US production happening now, and the international Model S sedans already built and now winding their way through the system to customer overseas, it appears Tesla is going to have a last month vs full quarter split like it never has before. With all the fanfare one would expect from Tesla Motors and its CEO Elon Musk, the much anticipated/oft delayed Model X arrived in September, with a big launch party - of which you can check out the full video of (as well as newly released details/specs) here. After delivering the first 6 copies of the Model X in September, and a handful in October and November, Tesla heated things up a bit in December, delivering an estimated 199 copies during the month, and exactly 208 in Q4 - ending the year with 214 sold. If one thing could unwind Tesla's guidance to hit 16,000 EVs delivered in Q1, it would the Model X. Tesla never broke out how many Model X SUVs they intended to deliver in Q1, but probably whatever number that was...they aren't on track to hit it. 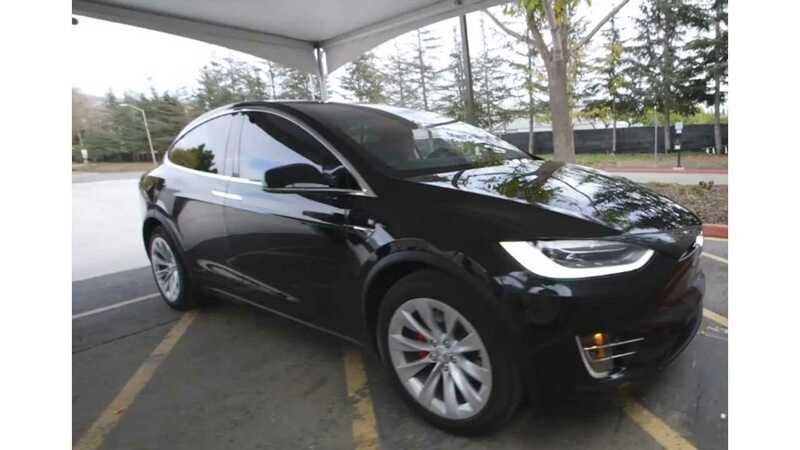 Despite first official deliveries of the Model X happening in September, there is still $40,000 deposit, Signature orders out there waiting on all-electric SUVS in the US some five months later. To be fair, most confirmed US Signature orders appear have gone out, but it is clear that certain options have triggered an almost indefinite hold on deliveries. So much so that 'regular' production Model X deliveries have now leap-frogged the Sigs, starting around the second week of the month. That being said, Tesla didn't exactly open up the production floodgates for the 'gen pop' edition X, and only those optimized for existing production configurations of the P90D X seem to have been produced. We estimate 400 Model X electric vehicles went out in February. Looking to next month, Tesla appears to have flagged another decent batch of Model X orders to head to production, but so far the build process (and subsequent QC holds) on the SUV have been much longer than that of the Model S on average. With the quarter goalposts in mind, and needing to put up a big deliverynumber in March, we figure Tesla will decide (if they have not already) to just go ahead and focus on ol' reliable (the Model S), and push the first real volume deliveries of the Model X into April/May. The first (and widely anticipated) plug-in offering from Volvo to be offered in the US arrived late December, and the company posted 226 sales in its first full month in January, then followed that up with a sturdy 176 units moved in February. Although we have to say, the numbers didn't surprise us too much, after watching the model sell well in Europe last year. 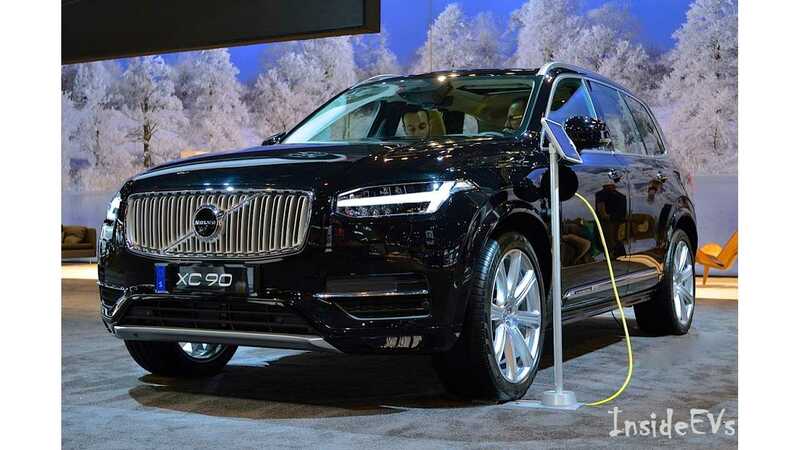 It is still a good bet that many in the US will be pleasantly surprised with how well the plug-in XC90 is received. 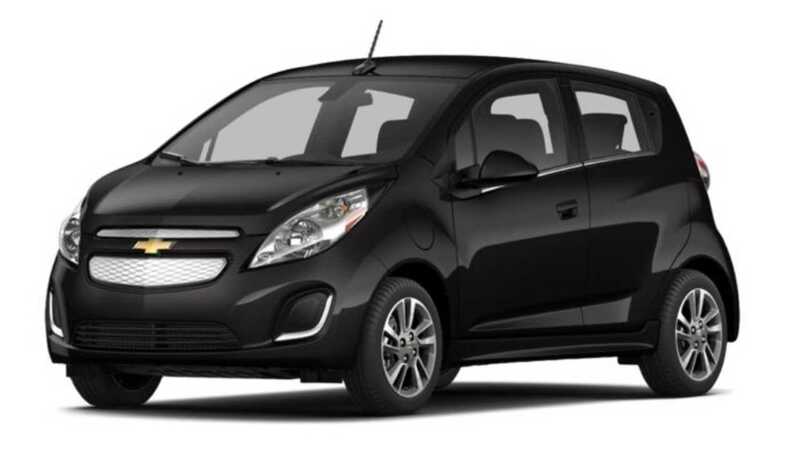 With the 2016 edition finally arriving in December, the Spark EV was once again free to sell at a more appropriate level to demand. For February, a fairly inspiring 216 copies where sold into the hostile (for EVs) winter month. This number represents a 82% increase over the year prior. Previously in January 139 were moved, which was also up a good amount - 62% from a year ago. The new 2016 inventory also continued to grow throughout February, and we head into March with more than ~300 available to be purchased (and who knows how many more are penned up by GM waiting to find a dealer-home). We have always felt that the A3 e-tron had a real shot to be the "dark horse" surprise seller of 2016, and in the plug-ins first couple months on the market, it has not not disappointed. For February, 248 A3 plug-in hybrids were moved, after previously selling 327 in January, keeping the Audi solidly in the "top 10" plug-in sellers for 2016 in the US. Originally, the plug-in Audi was scheduled to arrive as a week 43 arrival (October 19 through 26), but a certification problem with California regulators kept a growing inventory penned up until the very last week of the year. Part of the reason for those high expectations for the A3 e-tron is the low price. $37,900 gets you the Audi badge, 8.8 kWh of battery - good for 22-odd miles of real world driving...and federal credit of $4,158, which is significant because this brings the e-tron package down to within $2,800 of the base MSRP of the A3. 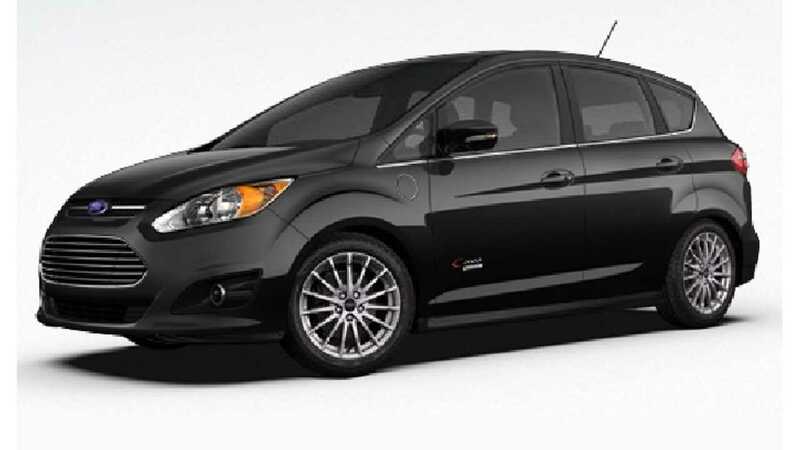 Ford accomplished something with the Fusion Energi that few other models can boast - they bested the Nissan LEAF for sales during February! In total, 932 Fusion Energis were sold, a 60% improvement over January, and a 54% gain from a year ago. Previously in January a respectable 581 were moved into the most hostile month for plug-ins sales in the US. Looking at the inventory and it is easy to see why (and how) so many Fusion plug-ins have sold over the past few months; the Fusion Energi is currently the "most stocked" EV in the US at around ~4,500 copies. The reason, a new refreshed 2017 Fusion Energi is on the way, and Ford likely overbuilt inventory for a delayed hiatus. Whoosh - is the sound of Prius PHV sales as the remaining inventory circles the drain. It is all over. See you in 2017. Toyota is lucky that the Mitsubishi i-MiEV is still officially on the market, because otherwise the Prius PHV would find itself at the very bottom of the plug-in sales charts for 2016. For February a new low was moved - just 6 copies. In January, just 10 were sold. The reason? There isn't any left. In 2015, just 4,191 were sold, which was off almost 70% from the 13,164 in 2014. We would like to note this was not a reflection of US demand for the car, as we feel they would easily buy 800-1,200 copies a month, it is simply the fact production of the current car ended this past summer - and Toyota messed up making a seamless transition to the next generation model as it did for the regular hybrid. Although a next generation Prius PHV is confirmed, delays in the 'regular' Prius have pushed the plug-in version's introduction as far off as late in the second half of 2016 as a 2017 model car. This means we are in the midst of a ~14 month gap (with zero production) and there will be no newly produced cars to sell over that period. 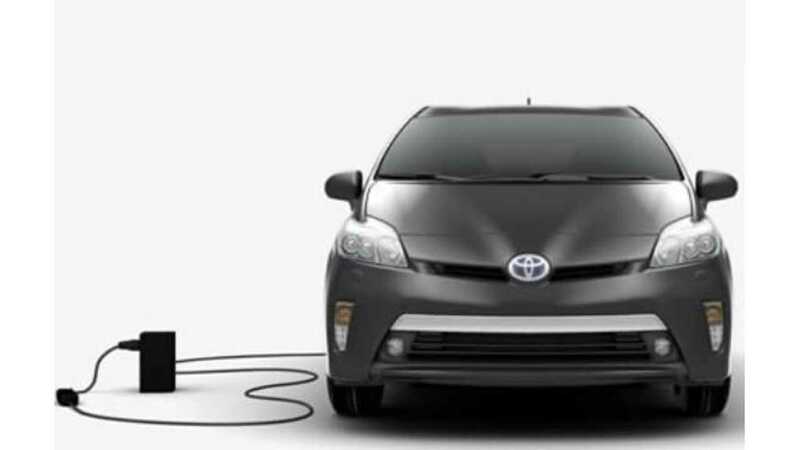 Our prediction going forward, is there isn't any left for all of 2016 - and every low volume plug-in will clean the Prius PHV's 'sales clock' this year until the company makes up some slight ground at year's end - which is a shame, because the demand to move a good volume has never waned with the US public, only Toyota's desire to sell them. After setting a new "best ever" month for the S550H with 35 copies sold in December, Mercedes still managed to sell a (relatively speaking) decent amount in January and February - with both months tallying 19 sales. 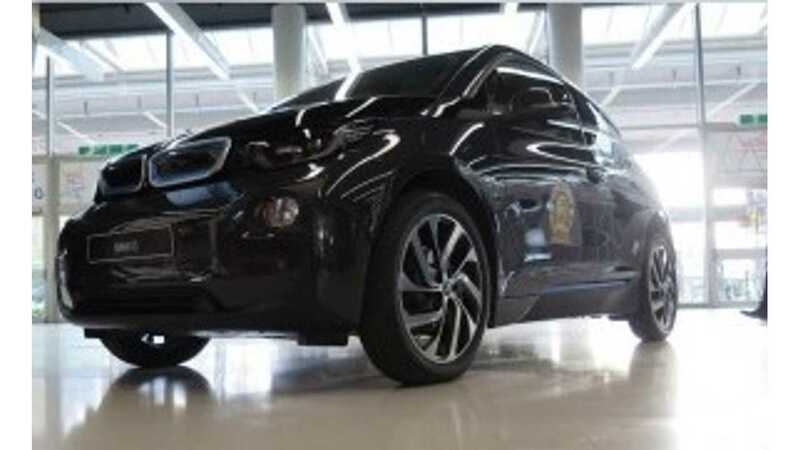 Range is rated at 12+ miles with the Prius-like "electric + gas" tag, meaning you have to drive with a certain light-footedness to get the 20 miles on just electricity. 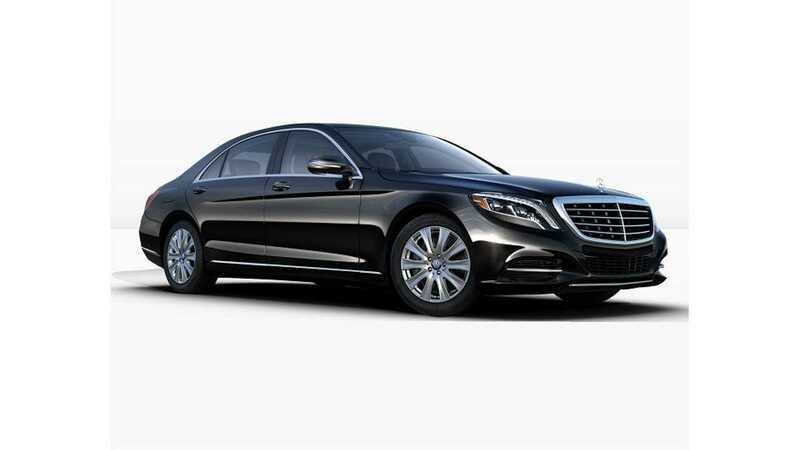 The S550 has a 8 kWh battery on board, so expect about a $4,700 federal tax credit with your purchase. We didn't expect to see the plug-in Sonata arrive in the US until the very last couple weeks of the year, yet there it was at a dealership we passed by in late November. 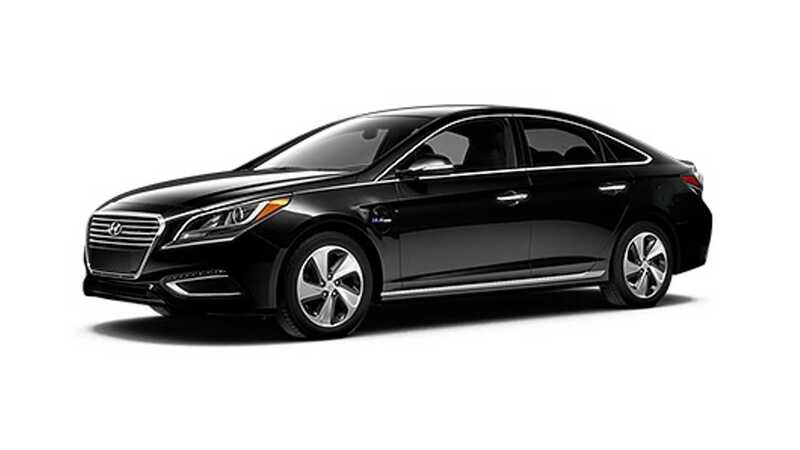 January was the first month the Sonata plug-in was even decently stocked, and Hyundai sold ~175 copies of the Sonata plug-in, indicating it will be a strong player in the EV space for 2016. For February, sales grew slightly in the US, to an even 200 units. 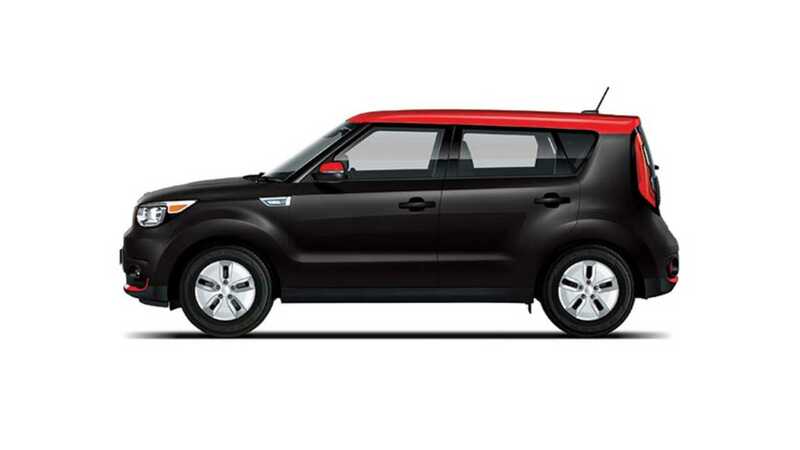 The only question now is if Hyundai will inventory it like sister-company Kia with the Soul EV (as in hardly at all). Heading in March about ~500 showroom copies were available in limited states - although the car is available by customer order in all 50 states. 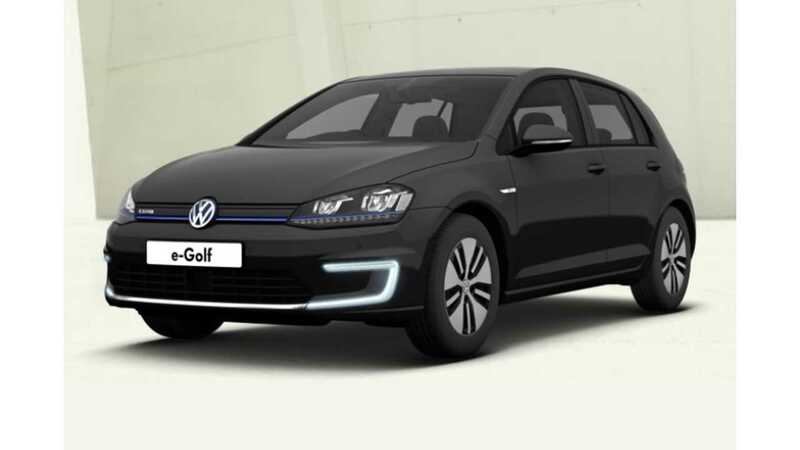 Volkswagen e-Golf: For February, 198 e-Golfs were sold, which was 52% gain over 2015. Previously, the plug-in VW sold a very strong 328 copies in January, and the EV looks to be making a statement that it will not be lumped in with the "compliance" cars in the US. 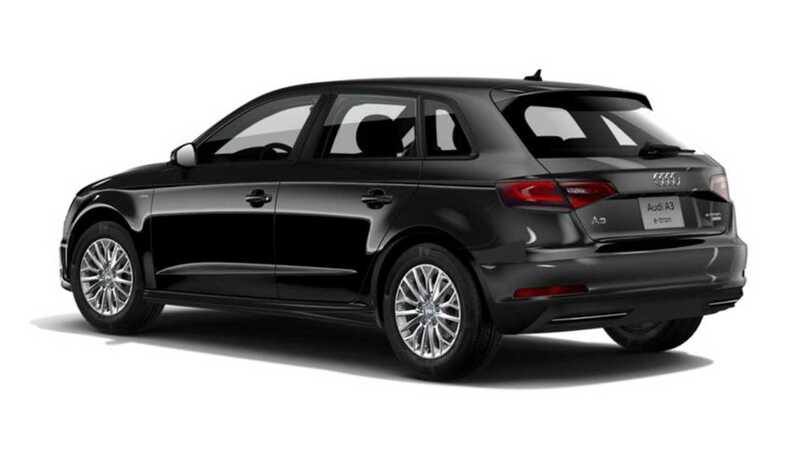 Adding to the demand in the US, the company recently introduced a new, less expensive SE trim level. The new trim level brings the base starting price of the e-Golf down to $29,815. How high could sales go? Still fairly hard to say without a deeper inventory allocation, but sometime hitting 4 digits doesn't seem hard to fathom today - at least when (and if) inventory levels get high enough to support that many sales. Despite the high profile nature of "Dieselgate" and the German company's desire to show off it's green cred at every turn, they have yet to do it by putting e-Golfs on the lots, heading in March just around ~250 copies were available. 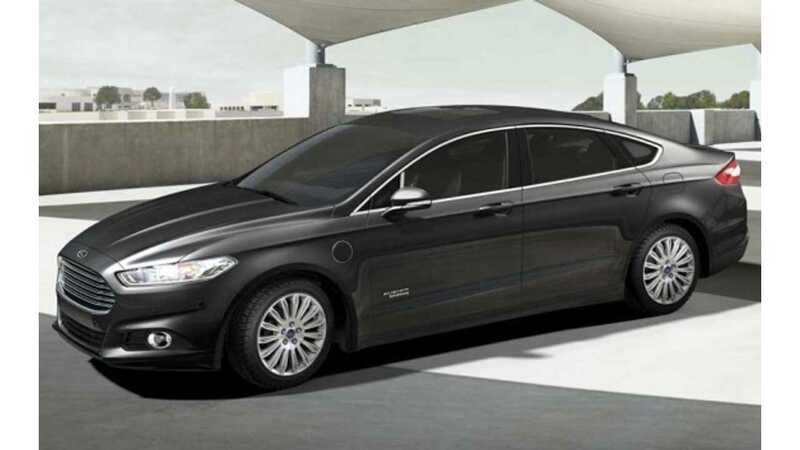 Both of Ford's plug-in hybrid products had a revival of sorts in February. For the C-Max Energi, sales were up 40% from January at 490 units, which is roughly the same as a year ago. Overall, the 'standard' C-Max sales in the US have been fairly woeful since Ford launched the car...and the C-Max Energi pays the price each month for that lack of interest. During February just 880 C-Max Hybrids were sold, meaning the plug-in version made up some ~37% of all sales for the model. Previously in January, the 350 C-Max Energis sold was about a third of the total C-Max family (987 units). 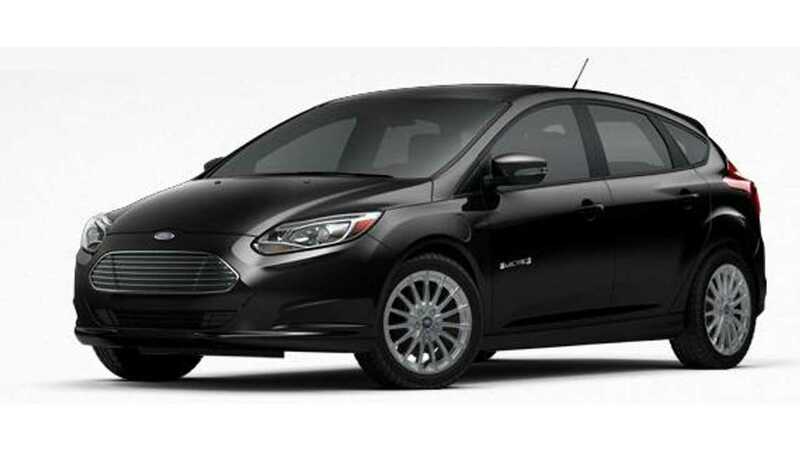 We should note that unlike its sister car the Fusion Energi, the C-Max Energi has a limited ceiling for sales as the inventory is much more tightly controlled to about 1/3 that of the Fusion. Heading into March, about ~1,500 were in stock - still a respectable amount. 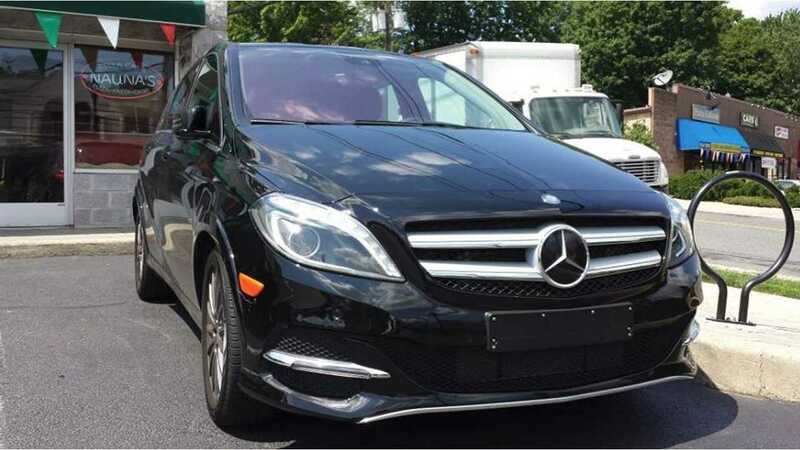 The Mercedes B-Class, now officially known as the B250e for 2016, continued to be sold in February...which is about as positive as we can be for the model, as just 37 were sold. Last Fall we also heard news (via a normally very reliable source) that Mercedes was about to get serious with the B-Class ED, giving it an estimated 300 mile (NEDC) ~225 mile EPA range upgrade in next generation trim, while also removing the Tesla drivetrain/components to bring costs down. It seems as though the B-Class ED may be one of the "ones to watch" heading into the 2nd generation wars in a couple year's time. 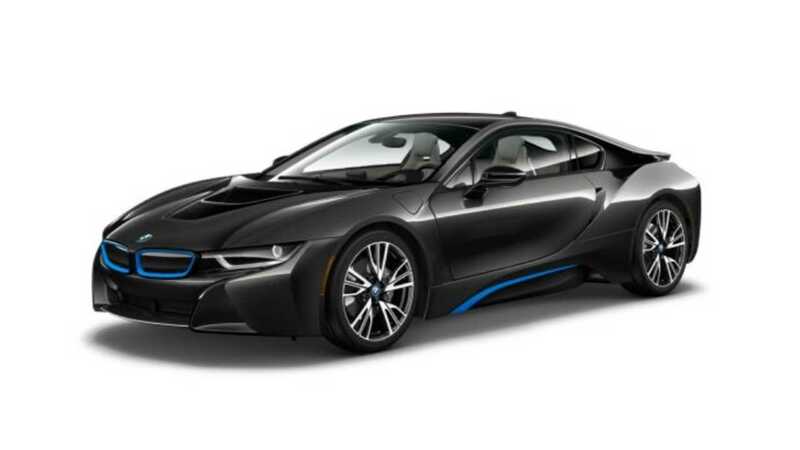 After selling an almost unfathomable 656 i8s in December, sales plummeted a zillion-percent (technical term) to just 32 in January, and we thought that number was certiain to normalize in February. And it kinda did...with 54 i8s sold. A number tha is still off more than 50% from a year ago. How did this happen? Was it the new calendar year? The bad weather? Did BMW salespeople refuse to let potential i8 buyers in the showroom? Who can tell...lets just hope the situation rectifies itself next month. As for that December figure of 656, that was a new record. The old record was just 217 units, so to say this result was unexpected would be a massive understatement. 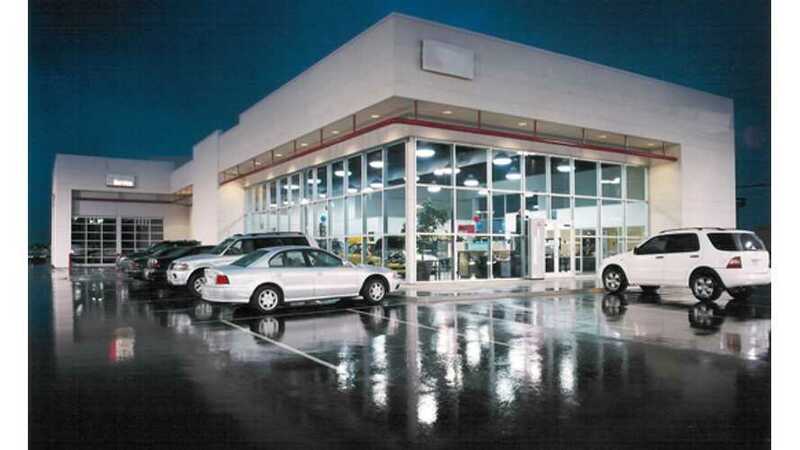 Despite the extremely low January and February sales results, one can't put the blame on inventory issues as the model has been well-stocked over the past few months. Heading into March about ~800 copies are available to be purchased - pretty close to a new all-time high. 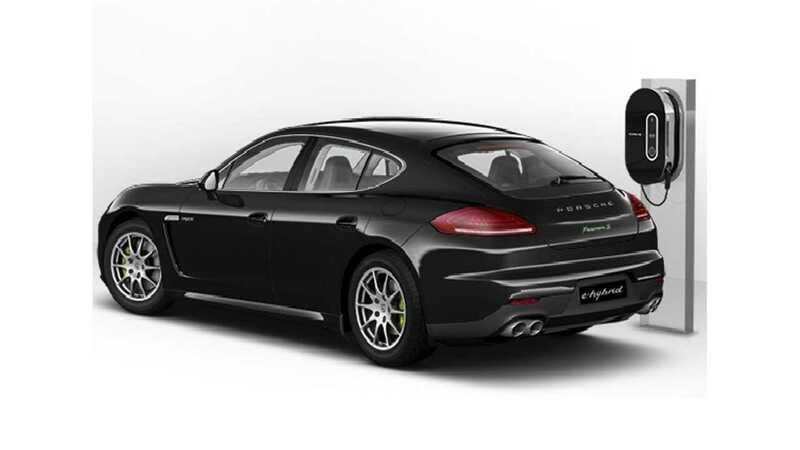 For February, the Panamera S e-Hybrid rebounded slightly selling 33 copies, 6 more than in January. Basically, the upcoming refresh probably can't come soon enough. The high mark for sales on the Panamera was set in the very first month it went on sale, with an amazing 141 sold in January of 2014. The advent of the Cayenne plug-in means that this level will never be seen again. In January 145 were sold (after moving 137 in December), but somehow Porsche managed to sell 172 in February - a new all-time record...truthfully, we are unsure how such a thing could have happened. But it did. 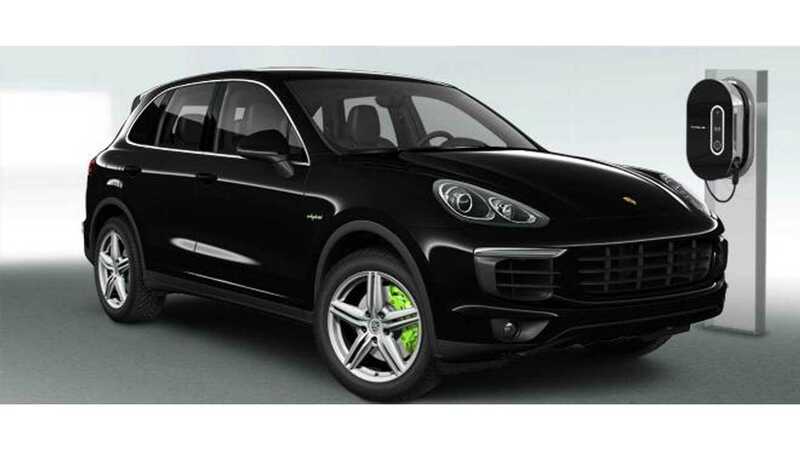 And while the e-drivetrain/abilities of the Cayenne and Panamara are very similar, Porsche customers have spoken - they want the Cayenne, as sales of the plug-in SUV outnumber the sedan usually by a ratio of about 5-to-1. Even Porsche seems to have noticed, as inventory of the plug-in SUV approached 400 units for the first time in the US heading into March. UPDATE: After initially have some issues getting data on the plug-in Fiat, more registration and rebate data is now available. That being said, the number is estimated. Historically, the average margin of error per month has been about ~50 units in those moments when some confirmed data leaks out (usually from a recall). 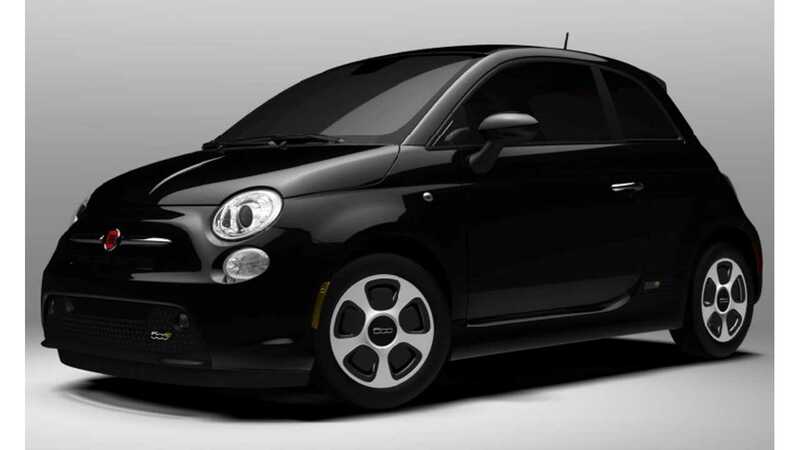 For February, we estimate 210 all-electric Fiats were sold. Showing that the demand in December was no fluke, BMW managed to sell another 345 copies of the X5 plug-in for February - a pretty great accomplishment given the hurdles of selling EVs in the first months of a new year. Earlier proving that everyone loves an SUV (at least in America), the BMW X5 xDRIVE40e (which we will now just call the X5 plug-in...because its easier) sold a massive 607 copies in December in just its second full month on the market. Looking at the potential for future sales, more than ~1,200 copies are now on hand heading into March - a new all-time high, so we expect some decent numbers going forward. 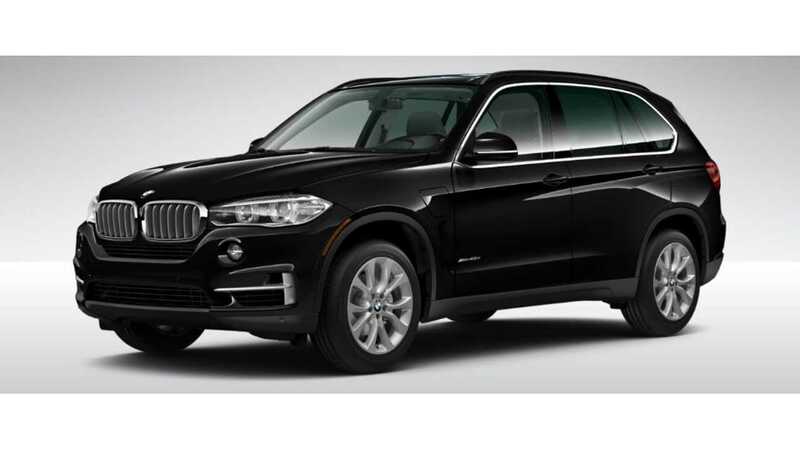 Can the X5 plug-in break into the top the "top" sellers in the US in 2016? A couple of months ago we probably would have said that was highly unlikely, but ~10,000 sales in 2016 doesn't seem so foreign today. Despite having a model lineup that is half-convertible, smart had a sales resurgence in the last two month of 2015. In December and November smart sold 179 and 178 copies (respectively). December's result was also the best for 2015, although far short of the all-time record set in December of 2014 when 351 were sold. The smart Ed ends 2015 with 1,387 sold - good for the 13th on the top selling plug-ins list for America. 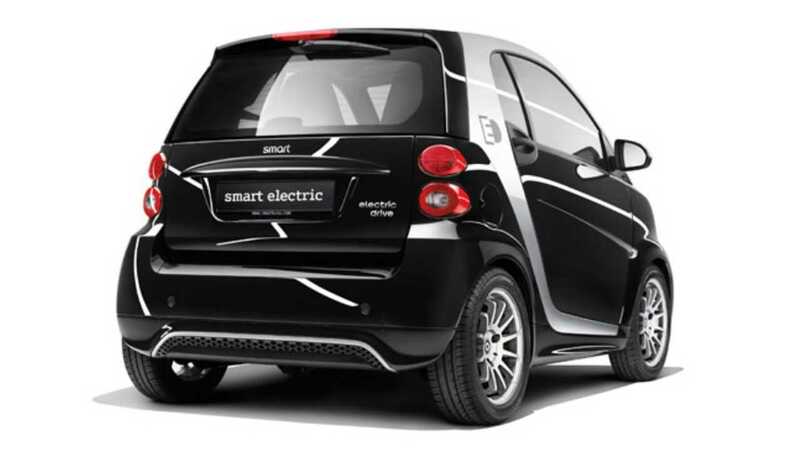 The smart ED is the first plug-in for America to be offered with a "battery rental" option, which brings the cost of the Smart ED down to $19,990, but adds a $80 month battery rental payment, as well as includes a wider (and longer) battery warranty. Check out all the specs, options and pricing here. The 2-seat Smart electric car gets 68 miles of range from a 17.6 kWh battery. Another month, another nap for those interesting in following the sales progress of Ford's first all-electric offering. The Ford Focus is one of the longest available electric cars on the US market - and February marked the EV's 47th month to log sales in America, yet it never strays more than ~100 units from selling 150 copies per month. 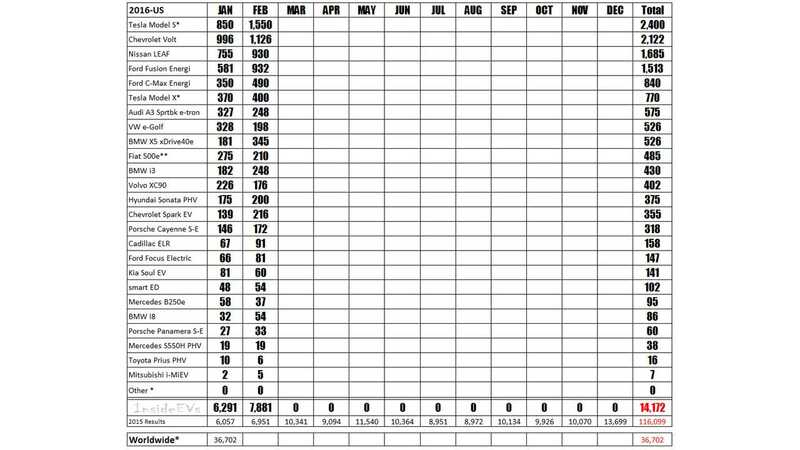 For February, and given the month is one of the weakest of the year for EV sales, the Focus EV was at the low end of its eternal selling range, moving 81 copies. Never straying far from 100 units in its first full year on the market, Kia moved 60 Soul EVs in February, after selling 81 in January. The 2015 high was set in October, but we have to temper our excitement for the achievement as that was only 109 units, and quite frankly, it should be doing much, much better.